As most enthusiasts know, Dolby Pro Logic has evolved over the years as a digital logic processor of stereo signals from any source, adding ambient and directional cues to create a 5.1- or 7.1-channel system from a stereo recording—CDs, DVD movie soundtracks, Blu-ray discs, even old stereo hi-fi videotapes. As a primer for newcomers, DPLII takes stereo information and “locks” in a center channel signal (movie dialogue or solo singers, for instance), detects ambient information and routes that to two surround channels (5.1), and leaves hard-mixed left and right information in the main front left and right speakers where it belongs. 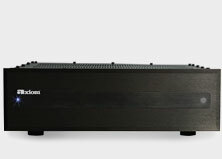 DPLII(x) appeared some years ago and further refined DPLII by adding two surround channels at the rear in addition to the main surround channels at the sides, to create a 7.1-channel system. At the time, most listeners conceded that the addition of two rear channels for a total of four surround channels certainly aided the distribution of surround information throughout the room, and generally enhanced the home theater experience, but not to the same degree that the two side surrounds did originally. The latest evolution, DPLIIz, introduces a vertical component to the more-or-less horizontal soundfield produced by a 5.1 or 7.1-channel surround sound system. 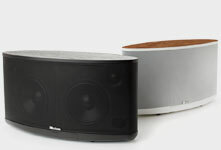 I say “more-or-less” because owners of Axiom’s QS8 or QS4 multi-directional “quadpolar” surround speakers know already that their upward-firing QS woofer/midrange drivers can deliver a palpable sense of height from ceiling reflections, especially on airplane fly-over effects and ambient weather sounds like wind and rain. What Dolby Labs has done is really isolate “amorphous” non-directional sounds (wind, rain, etc) and send those to an extra pair of speakers placed at the front mounted 3 feet or more above the main left and right stereo speakers. 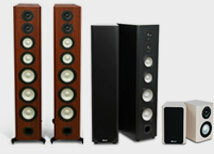 Dolby correctly notes that these “height” speakers enable more versatility in placement for a 7.1-channel system because they can also be used at the rear or as “height” speakers at the front. If a manufacturer has two additional amplifiers in an AV receiver, it’s possible to run a 9.1-channel installation for the ultimate in surround depth and envelopment. Do you need it? Some reviewers feel the enhanced envelopment delivered by the “height” channels is worthwhile. I would agree, especially if you are currently using conventional forward-firing surround speakers. Other demos have produced mixed results, including one this writer auditioned, in which listeners had difficulty determining whether the height channels were on or off. In the end, I suspect if you are using four Axiom QS surrounds in a 7.1 system, you already are experiencing impressive height cues if your surrounds are mounted 2 feet or more above ear level. The addition of two more surrounds at the front may further enhance envelopment, but depending on your room setup, it may be hard to detect. Finally, for those hobbyists who somehow feel there is something “simulated” or phony and “impure” about such logic processing of stereo signals, I’d emphasize that Dolby’s logic processing (and dts’s Neo:6 or Harman/Lexicon’s Logic7) works only with content present in the original stereo recording; it does not invent new content, so the integrity of the original musical track or soundtrack remains untainted. At times, the effects may seem a bit extreme depending on how the stereo source was mixed, but you are always in control and can either shut it off and return to plain vanilla stereo or adjust the surround speaker levels on the fly to reduce unrealistic extremes. 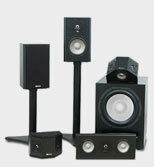 Have you compared systems that have QS surrounds with and without PLz height speakers? That is, when you say "The addition of two more surrounds at the front may further enhance envelopment, but depending on your room setup, it may be hard to detect," is this based on listening tests, or is it just a conjecture? Another journalist whom I've known for years and who blogs for Cnet participated in a blind experiment at Cnet with some other staffers there, and no-one could consistently tell whether the height surrounds were on or off. I did not participate in that experiment.